!! BUILT in the USA !! AGXGOLF STROKE SAVER (EZ-ROLL TYPE) VECTOR SERIES APPROACH CHIPPING IRON: MEN'S RIGHT HAND ALL SIZES IN STOCK!! 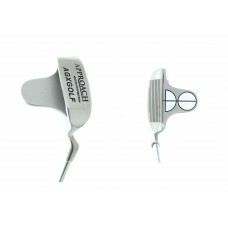 The Manufacturer's Suggested Retail Price for this club is $79.95: Your price is MUCH BETTER!! Simplify those touch shots around the greens! GREAT FOR BEGINNERS TOO!! IT'S SO MUCH EASIER TO LEARN WITH!! AGXGOLF is headquartered in Michigan and we build these fine clubs right here in our Highland Michigan shop! We hope you enjoy playing these fine golf clubs as much as we enjoy crafting them! We GUARANTEE that you will be SATISFIED!! Stated Shipping cost for contiguous U.SA. only. Other destinations will be billed at our actual shipping cost.